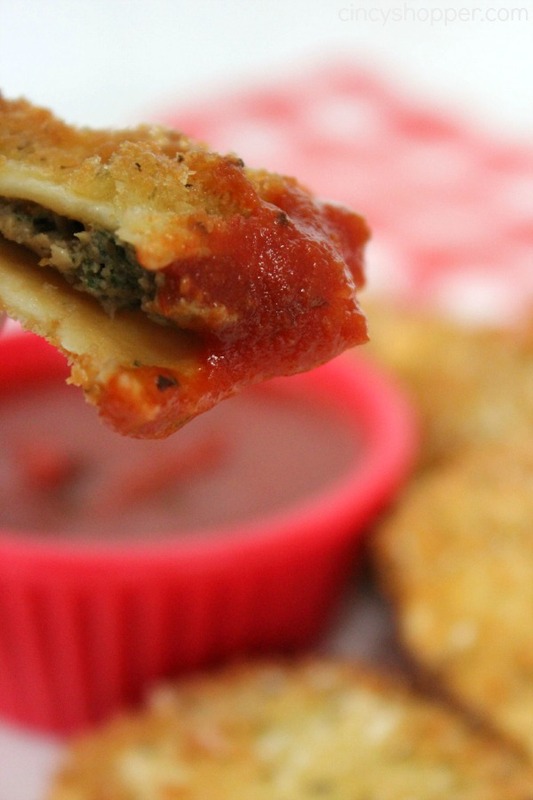 You can save some dollars and make this CopyCat Olive Garden Toasted Ravioli Recipe right at home! Olive Garden is one of my favorite places to splurge on when eating out. 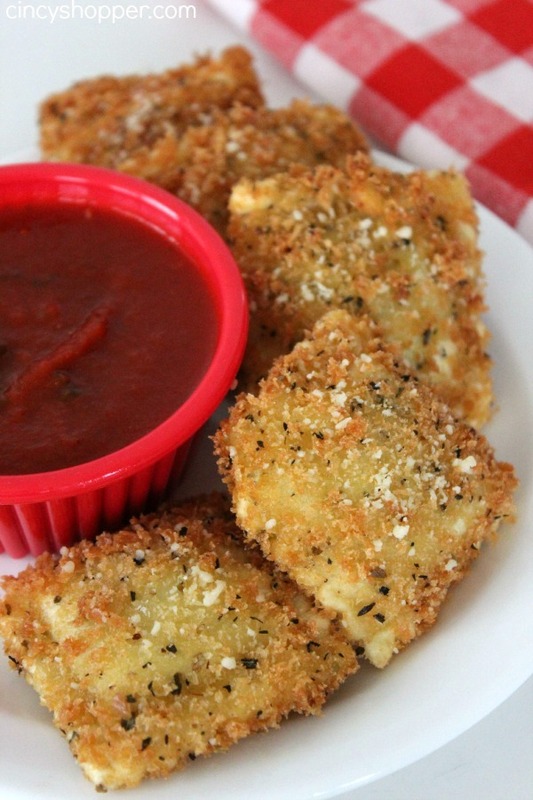 My favorite appetizer has to be the Toasted Ravioli. 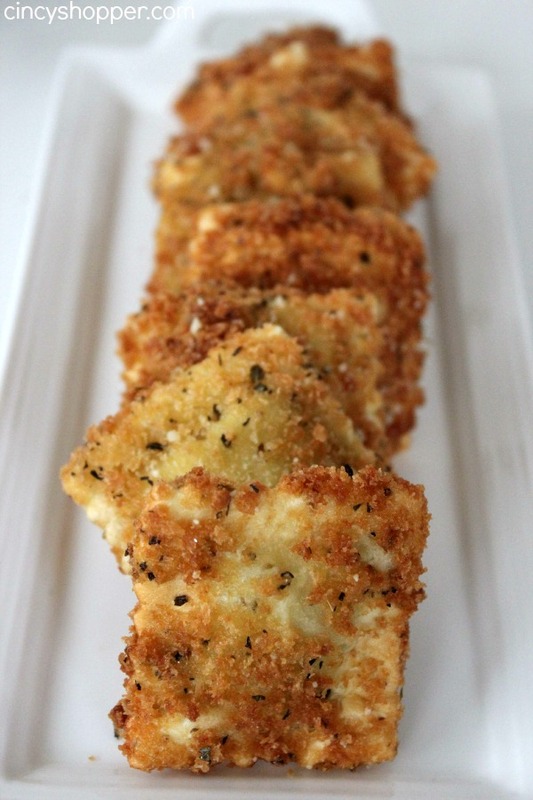 Loaded with great flavor and slightly fried makes this appetizer so delish! 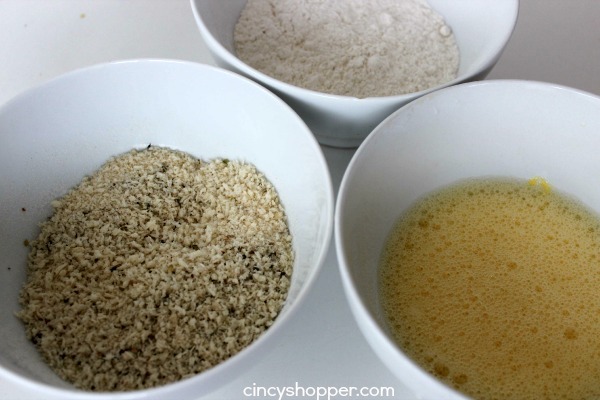 Last week I made my CopyCat Olive Garden Salad Dressing it really had me craving Olive Garden. So I decided that it was time that we make a copycat version of the Olive Garden Toasted Ravioli. To my amazement it is so simple. I snagged a bag of frozen beef ravioli when shopping at Kroger. I had all of the other ingredients right in my cabinet. The hubby and I made a salad and sat down with a big platter of these Fried Ravioli and had a mini feast! 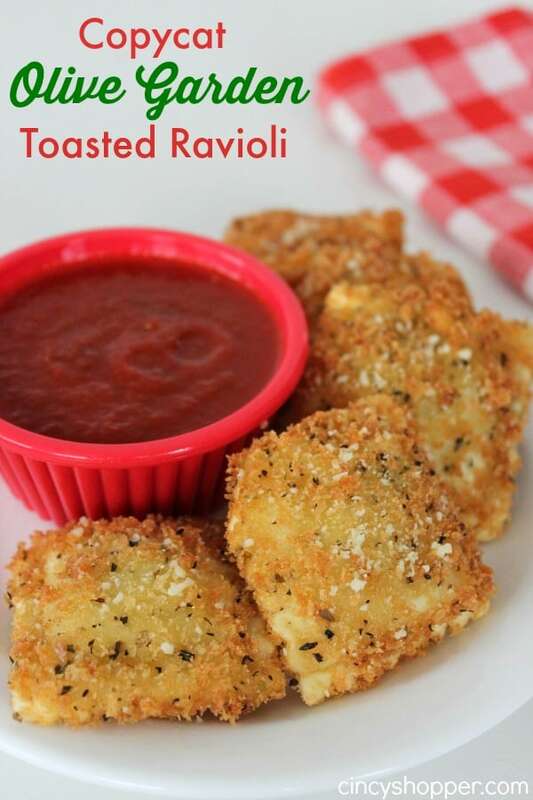 My hubby is not a fan of ravioli but he liked these so much that he bought another bag of frozen ravioli so we could make up another batch of these for our guests this weekend. We are going to make these and also a batch of our CopyCat TGI Friday’s Potato Skins. The slight crunch from the breading and then the combo of spices and meat are perfect. I just served these up with some store bought spaghetti sauce but you could make your own. Consider making the Slow Cooker Spaghetti Sauce Recipe I shared (it would be perfect). This CopyCat Olive Garden Ravioli will be perfect for when you are entertaining over the holidays or for game day (like the Super Bowl). Your guests will think you took all day in the kitchen making these yummy apps. 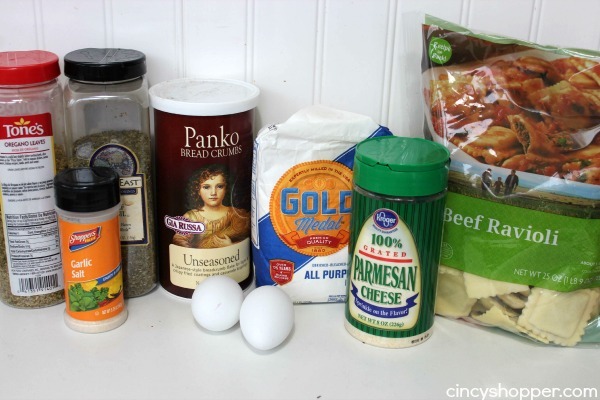 Check your cabinets for your ingredients you probably already have most on hand with the exception of the Ravioli. The cost of frozen ravioli is quite low so you can feed quite a few guests with just one bag. Beat water with eggs together. In another bowl, combine oregano, basil, garlic salt and bread crumbs. Place flour in a third bowl. 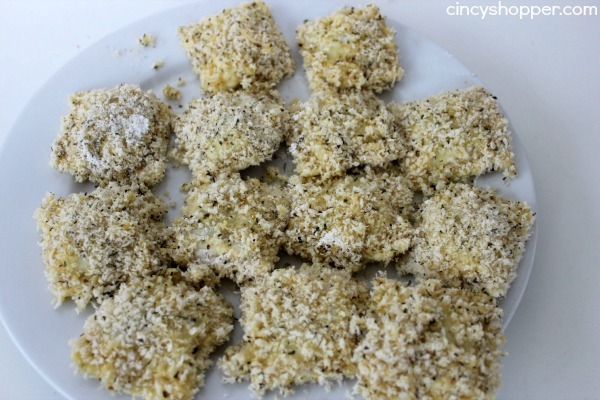 Dip each ravioli in flour then in egg wash and finally in bread crumbs and set on plate for 3-5 minutes. Carefully place in oil and fry until golden. Place on rack or paper towels to drain. Sprinkle with Parmesan and serve with you marinara sauce. OMG! These are delicious! I made then tonight! Do you need to boil the ravioli first? Hi Kathy! There will be no need to boil your ravioli first. We just let ours thaw out which did not take long before frying them. I hope that helps and that you enjoy them as much as we do. Do you think I could use cheese ravioli instead of the meat ones? I used spinach mozzarella ones and they worked fine, there was some cheese that came out but when the cheese got fried up they tasted great. Make sure your oil is HOT if not they will stick and get completely ruined (learned that with a few of them. Can you use canned Chef Boyardee? Thank you so much for this recipe. I made it tonight and it was great! 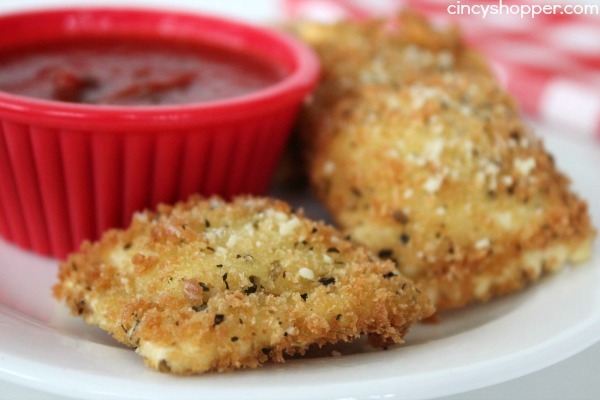 I love toasted ravioli! These look delicious! Thanks for sharing. Can these be made ahead of time and kept warm in oven? Hi Sandy! I would imagine so! I would think they would still keep crispiness for a bit of time in the oven. Could you fry them in an air fryer?